Behrokh Khoshnevis wants to transform the world one building at a time. 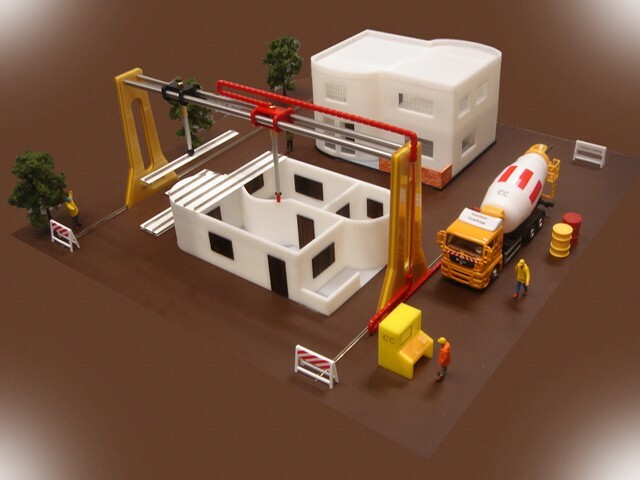 Khoshnevis has spent 20 years making a Contour Crafting, a 3-D printing technology for building construction, a reality. The current machine has built 8-foot high walls and can “print” a 300-square-foot structure. Contour Crafting could reduce the amount of construction waste in a typical Wal-Mart from 500 tons to 50 tons. Compared with concrete masonry unit construction, the process used extensively for industry buildings, freeway sound barrier walls and low income housing, Contour Crafting cuts carbon dioxide emissions by 58 percent, with the building’s total embodied energy reduced by more than 87 percent. The current machine breaks into three parts, plus assorted rails, pump systems and mixers, making it easy to transport the whole system to building sites and into disaster areas. In less than an hour, the Contour Crafting machine can be assembled and working. Right now, the technical holdup is building real buildings for test to go through the expensive and tedious regulatory certification process. Building a traditional house in the United States takes from six to nine months, and purchasing the same can be cost-prohibitive for those with lower incomes. But with Contour Crafting, a complete, custom-designed house can be built in one day at a fraction of the cost. Much of the cost savings will come from shaving off labor and time, as the machine needs only three operators to build 300 square feet in one hour. But the 3-D printing technique also cuts out an exorbitant amount of waste. Building a typical single-family home tosses from three to seven tons of material into a landfill. Contour Crafting, according to Khoshnevis calculations, could reduce that waste stream by a factor of 10.